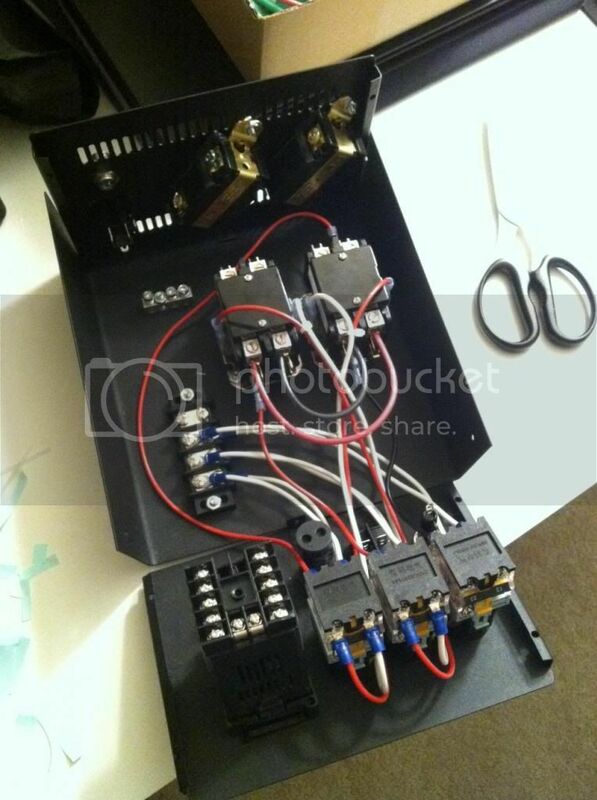 I am not an electrical engineer or a certified electrician so I'm looking for some input. I have a good knowledge of AC and DC but aside from doing general home wiring repairs and PC wiring I don't have a lot of experience. The project I am working on now is an electric home brewery. This isn't a new concept, and there are a lot of people that have built very similar setups. I didn't want to fallow a guide/plan and not really know what I was doing, so I did a lot of reading on electrical circuits and components to determine what I need based on what I'm trying to do. Here's a description of what I'm trying to do. - 62qt stainless steel kettle heated by a 5500w heating element. 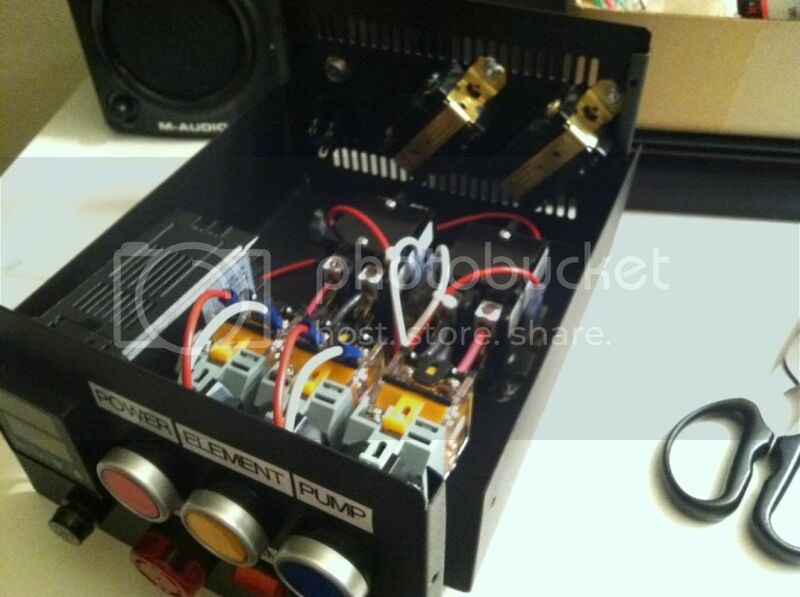 - The heating element will be controlled by a Solid State Relay and PID controller . - 1/20hp pump for recirculating liquid in the kettle and draining. - Pump is also on on a Rheostat to control flow. Primary Goal: don't die. Secondary, build this as safely and efficiently as possible. This is the diagram I came up with. I'm looking for some feedback, suggestions, improvements, confirmation that I did this correctly or not. Thanks! 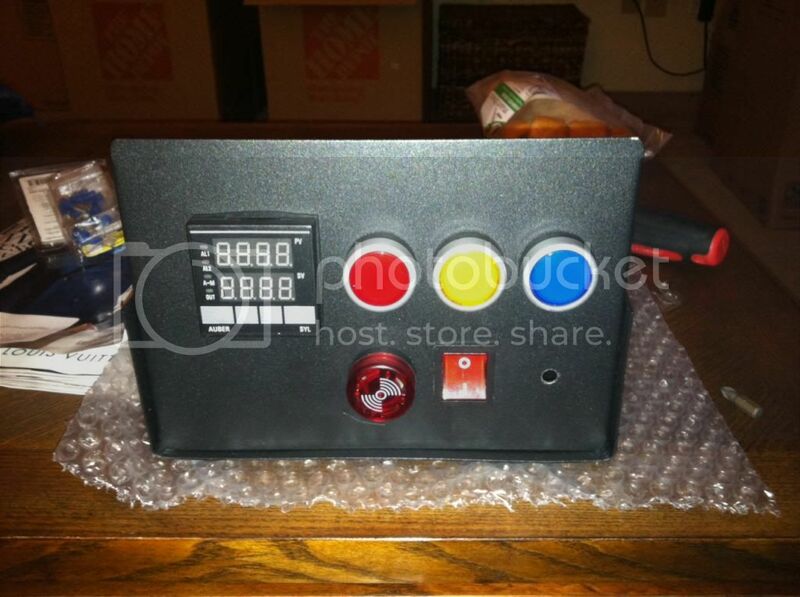 Yeah, once I get some feedback I'll hopefully be ordering the control box components by Friday. 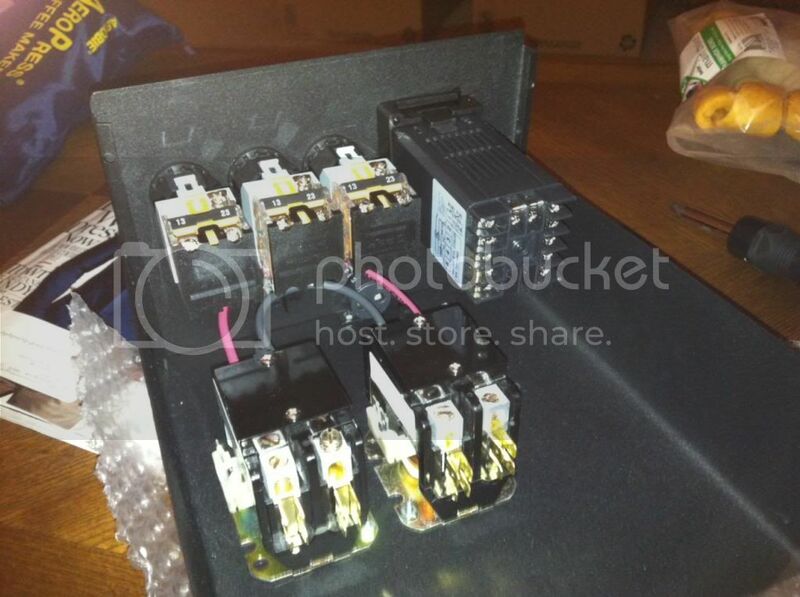 And, my primary question is should I go with a 40A contactor relay for the Main Power switch? I wasn't sure if the 27A total was too close to the 30A max on that main contactor. Its going to be pretty easy to get start up spikes in current draw in your pump, would go with 40A in my opinion. 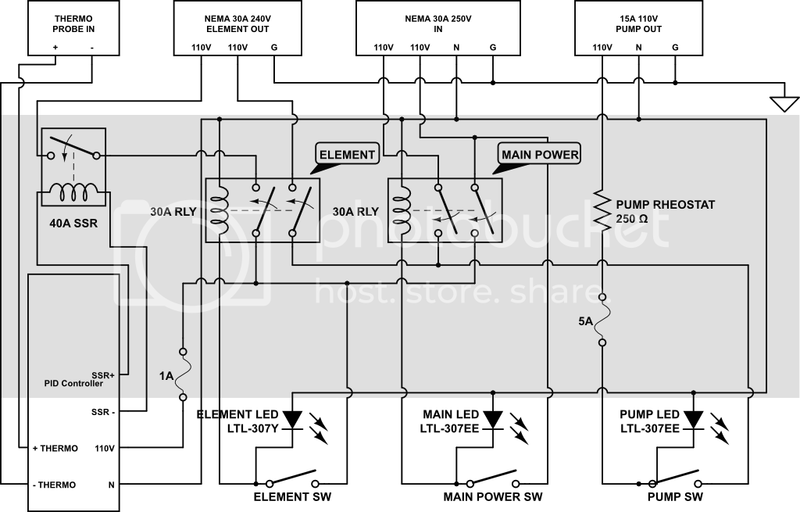 Get a good multimeter and check continuities before hooking up any power. Then check voltages before hooking up anything expensive. I don't have any AC power experience to add, but it looks reasonable to me. Also make sure you get AC relays. 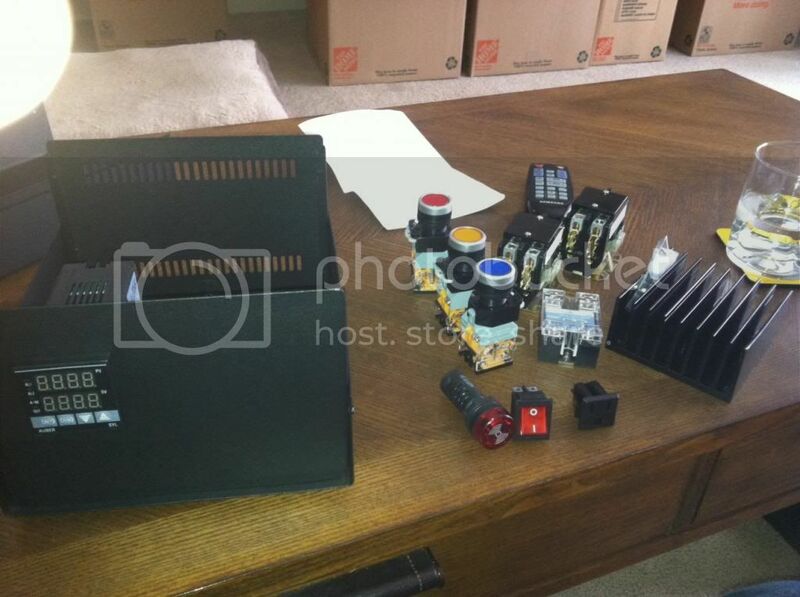 Okay, I am going to upgrade both of the relays to 40a (only a couple more dollars) and order the parts. Got started today mounting all the components in the chassis. 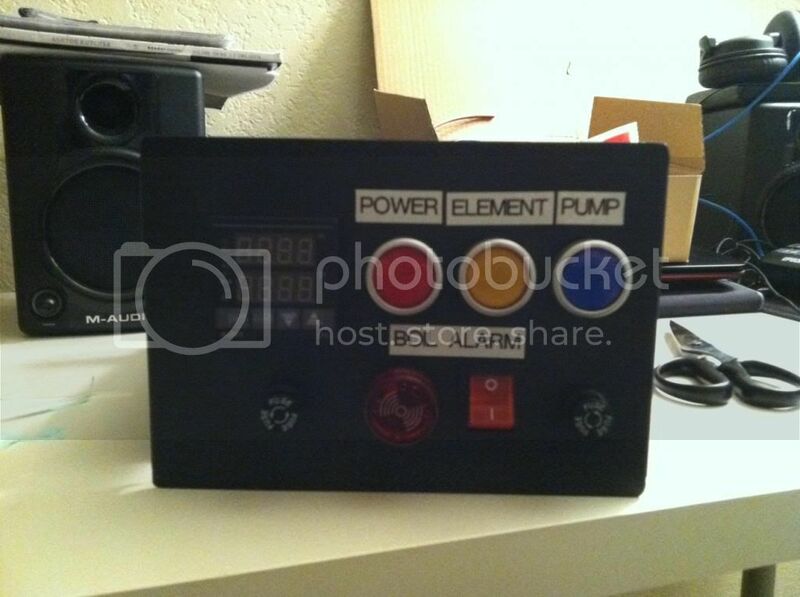 A shot of the front, the PID controller, Red (main power), Yellow (Heating Element), Blue (pump), the lower red device is a flashing/buzzing alarm for a boil temp indicator, a rocker switch to turn off the alarm, and the other hole is for the pump rheostat. I'll get started wiring it up this week. Yes sir, the main case and the top panel are both grounded. What sort of thermal probe are you using? 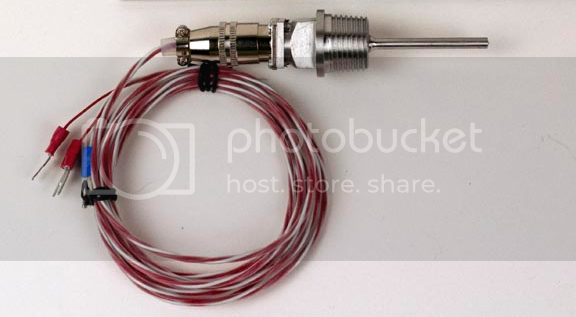 A stainless steel threaded probe, like this. i thought @gnomequeen told you to stay out of her sock drawer. This is amazing. Please continue. I was talking with some dudes on Reddit, and concluded that the pump will probably burn out the resistor. So, I am just going to use a ball valve to control the flow from the pump. I would recommend a needle valve for better control. If you're worried about being able to open it quickly for pump safety, build in a ball-valve bypass. True, but stainless steel needle valves are expensive as all hell. I don't need precise flow control, just half or full on. I think a ball valve should work. Good thing you went with the larger amp relays... Going to be stressing your pump more that way. Yeah, its only a 0.26 amp pump. How much do you think the amperage could swing under start-up/stress? Little update, did some more assembly last night. Also, this is really freaking sweet. Once this has proven itself, I think I just might have to build a one. Thanks. When I'm all done I'll post of video of using it for the first time. Or, you will know to look at my iPhone for my last minutes. I read that as "look for my iPhone" as in, lost in the first brew. iBeer, with only a hint of glass and plastic. More along the lines of a "found footage" horror movie. This thread gives me a beerboner. I think I would've gone with a variac instead of a rheostat for the pump throttle. If it's based on a universal motor then you could also use a triac or SCR-based dimmer circuit.